W55000 sits in the platform at Buckfastleigh as 5526 takes water. 15th February 2010. Dave Court "learning the road" in the bubblecar on Tuesday 16th February 2010. 5526 arrives at Totnes Littlehempston. 17th February 2010. The week-long event proved to be an enormous hit with the public. 2-6-2T 5526 operated the standard South Devon four-train service from Sunday 14 to Thursday 18 February, with the bubblecar – W55000 taking over for Friday, Saturday and Sunday. There were occasions when the auto trains were packed to standing, and the bubblecar had to be strengthened with a trailer for the first train on Friday. Both Mike and Dave were full of praise for the friendliness of everyone they met on the South Devon Railway, and look forward to visiting again. GWR 0-6-0 Pannier Tank 5786 stood in for 5526 on Wednesday morning to allow for essential repair work, and the bubblecar similarly came to the rescue for the last trip on Tuesday afternoon. 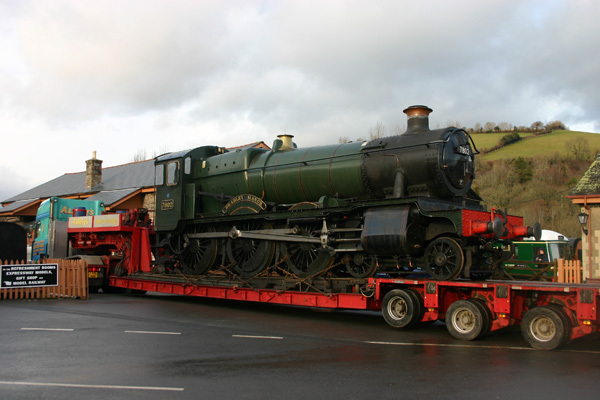 Bradley Manor ready to leave Buckfastleigh following repair. Allely's provided the transport. Allely's brought this coach down from the Severn Valley Railway when they came to collect bradley Manor. GWR 4-6-0 Bradley Manor left the South Devon railway on 18 February 2010. It has received attention in the SDR’s workshops, and the locomotive is going back to the Severn Valley Railway. At the same time an ex-GWR coach arrived from the Severn Valley. 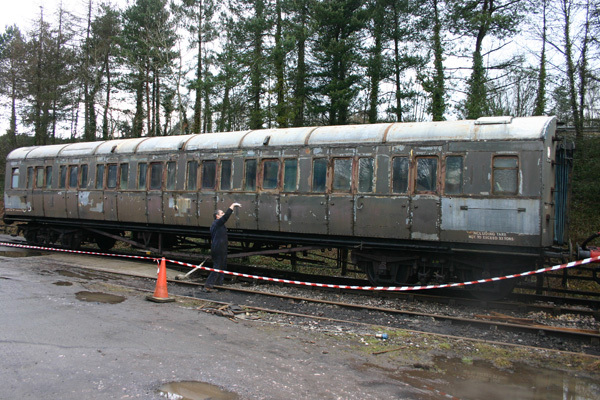 Built around the 1930s, the vehicle will require extensive repair and refurbishment before it can enter service on the South Devon.